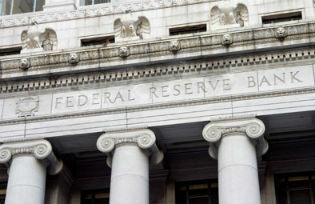 In May 2013, Federal Reserve officials first began to talk of the possibility of the US central bank tapering its securities purchases from $85 billion a month to something lower. A milestone to which many observers point is 22 May 2013, when Chairman Bernanke raised the possibility of tapering in his testimony to Congress. This ‘tapering talk’ had a sharp negative impact on economic and financial conditions in emerging markets. • Not only was the impact sharp, but in the view of many commentators, it was surprisingly large. The most alarmed (some would say alarmist) commentators raised the possibility that some emerging countries might be heading towards a full-blown crisis like those in Mexico in 1994 and Asia in 1998. • The impact was not felt uniformly; different countries were affected rather differently. • There were complaints from policymakers in the developing world about the Fed’s turn to tapering that were seemingly hard to square with earlier criticisms of quantitative easing by the US central bank as a form of ‘currency war’. In a new paper, we attempt to shed light on these issues (Eichengreen and Gupta 2013). We use data for a cross-section of emerging markets to analyse who was hit by the Fed’s tapering talk and why. We focus on the change in exchange rates, foreign reserves, and equity prices between April 2013 (just prior to talk of tapering) and August 2013 (by which time the response was largely complete). (In September, new data on the condition of the US economy led Federal Reserve officials to make statements that moderated prior expectations of tapering). In addition, we calculate composite indices of overall financial market pressure. These indices are constructed as a weighted average of changes in exchange rates, reserves, and stock market yields. They are constructed in a manner analogous to the exchange market pressure index of Eichengreen et al. (1995), where the weights were the inverse of the standard deviation of each series. We first create this index using data for exchange rate and reserve losses, and then add the negative of the change in stock yields (denoting the two versions Index 1 and Index 2, respectively).1 For weights, we calculate the standard deviations for each series using monthly data from January 2010 to August 2013. The weights are then the inverse of the standard deviations. • Observable macroeconomic fundamentals like the budget deficit, public debt, foreign reserves, and GDP growth rate in the prior period. • The size and openness of a country’s financial markets. • The extent to which capital flow sensitive indicators like the real exchange rate and current account balance had been allowed to move in the prior period when quantitative easing was underway, there had been no expectations of tapering, and policymakers in emerging markets had complained of currency wars. Results: Who was hit by tapering talk and why? • There is little evidence that countries with stronger macroeconomic fundamentals (smaller budget deficits, lower debts, more reserves, and stronger growth rates in the immediately prior period) were rewarded with smaller falls in exchange rates, foreign reserves, and stock prices starting in May. Investors seeking to rebalance their portfolios concentrated on emerging markets with relatively large and liquid financial systems. These were the markets where they could most easily sell without incurring losses, and where there was the most scope for portfolio rebalancing. The obvious contrast is with so-called frontier markets with smaller and less liquid financial systems. This is a reminder that success at growing the financial sector can be a mixed blessing. Among other things, it can accentuate the impact on an economy of financial shocks emanating from outside. • The largest impact of tapering was felt by countries that allowed exchange rates to run up most dramatically in the earlier period of expectations of continued Federal Reserve easing, when large amounts of capital were flowing into emerging markets. • The largest impact was in countries that allowed the current account deficit to widen most dramatically in the earlier period when it was easily financed. Countries that used policy – and in some cases, perhaps, enjoyed good luck – that allowed them to limit the rise in the real exchange rate and the growth of the current account deficit in the boom period suffered the smallest reversals. These results provides some intuition for how it was that the same countries could complain about quantitative easing while it was underway – QE had large, disconcerting impacts on local markets – and then also complain about tapering talk. Since their asset prices had been allowed to run up sharply and their current accounts had been allowed to widen relatively dramatically in the earlier period, talk of tapering now had a relatively large negative impact on local markets. We interpret changes in real exchange rates and current account deficits as picking up the impact – positive, negative or neutral – of macroprudential policy broadly defined. Recall that we control for the stance of fiscal policy (since fiscal tightening can also limit the appreciation of asset prices in a period when capital is flowing in). In addition, we control for the intensity of capital controls in the prior period; these, similarly, do not appear to have exerted a consistently significant impact on the effects of tapering. Nor does their inclusion alter the estimated effect of the change in the real exchange rate. Evidently, neither capital controls, nor fiscal tightening, nor even a combination of the two, sufficed to dampen the effects of financial inflows. Instead, a broader array of macroprudential policies which moderate the upward pressure on the exchange rate and the widening of the current-account deficit – limits on the rate of growth of bank lending, loan-to-value regulation for the mortgage market, and similar measures – may have made a difference, and may therefore be called for in the future. Our exploration of the effects of the Fed’s tapering talk in the summer of 2013 yields the following conclusions. First, emerging markets that allowed the largest appreciation of their real exchange rates and the largest increase in their current account deficits in the prior period of quantitative easing saw the sharpest currency depreciation, reserve losses, and stock-market declines when talk turned to tapering. Second, measures of policy fundamentals and economic performance (the budget deficit, the public debt, the level of reserves, and the rate of GDP growth) do not indicate that better fundamentals provided better insulation. An important determinant of that differential impact – in addition to the prior run-up of the real exchange rate and current account deficit – was the size of a country’s financial market. Countries with larger markets experienced more pressure on the exchange rate, reserves, and stock market when talk turned to tapering. We interpret this as investors seeking to rebalance their portfolios being able to do so more easily and conveniently when the target country has a relatively large and liquid market. This suggests that having a large and liquid market can be a mixed blessing when a country is subject to financial shocks coming from beyond its borders. Finally, there is little evidence that the presence of controls or their tightening in the prior period provided insulation from talk of tapering. More important, we suspect, were macroprudential policies broadly defined, where these were used to limit the appreciation of the real exchange rate and widening of the current-account deficit in response to foreign capital inflows. These patterns thus point to which countries will be vulnerable to external pressures once tapering again comes around. Eichengreen, B and Gupta, P (2013), “Tapering Talk: The Impact of Expectations of Reduced Federal Reserve Security Purchases on Emerging Markets“, World Bank Working Paper. Eichengreen, B, A Rose and C Wyplosz (1995), “Exchange Market Mayhem: The Antecedents and Aftermath of Speculative Attacks”, Economic Policy. 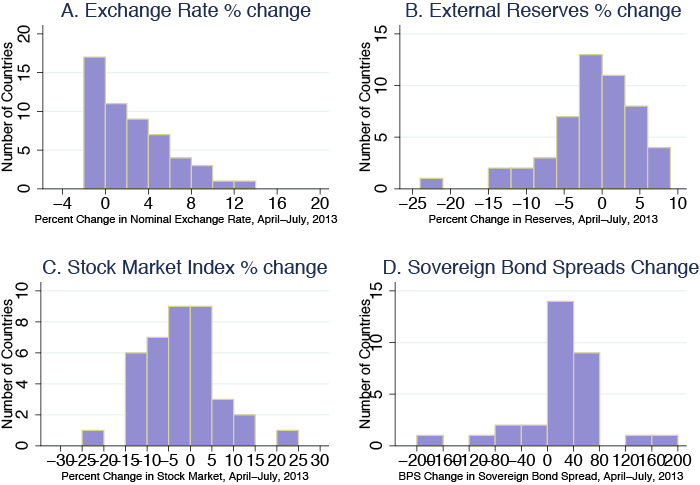 Ghosh, A R, J Il Kim, M Q Saeed, and J Zalduendo (2012), “Surges”, IMF Working Paper 12/22. P R Lane and G M Milesi-Ferretti (2007), “The External Wealth of Nations Mark II: Revised and Extended Estimates of Foreign Assets and Liabilities, 1970–2004”, Journal of International Economics, 73: 223–250, updated and extended version of dataset. 1 We also did the same including changes in sovereign bonds yields and credit default swap spreads, but these are available for far fewer countries (not all the countries in the sample having well-functioning government bond markets). 2 Financial market size is measured by total external private financing – i.e. inflows of equity, bonds, and loans (these are data for 2010–2012 from the Global Financial Stability Report of the IMF, transformed into logs). Alternatively, we measure financial market size as the portfolio liability stock from Lane and Milesi Ferretti (2012), as stock market capitalisation and as aggregate GDP. Reassuringly, use of these alternatives had little material impact on the results, since most of the alternative measures are fairly highly correlated.